Background updating of app data and “instant” launching of data brings application loading time on the Apple Watch down to 1/7th the time it used to take. That’s a pretty sizable increase, but this will no doubt add a lot of extra battery load and data requirements. Scribble on WatchOS will allow you to draw out individual characters on the screen to quickly respond without actually having to use the keyboard. The new SOS feature is probably the most important new feature for the aging public, as it competes with companies like Life Alert and the like by giving quick access to access 911/999 or whatever geographically relevant emergency service number is nearby. And it also sends an emergency text with location data to your contacts. It’s a wonderful feature, and I’m sure other cell phone operating systems will do this in the future. The number of lives this will save once it is fully adopted will be enormous. Breathe is an app that helps users take time out of their day and breathe more. It’s basically guided breathing, designed to lower your stress. Stress hormones (Coritsol) can lead to fat. Will Apple watches make you thinner? Who knows? Apple pay on the watch will allow more seamless integration with existing Apple Pay features. It looks like Apple is making a much bigger investment in Apple Pay – no doubt because it makes them more ubiquitous and it also allows them to make money on each transaction, competing with the likes of PayPal and Google Pay. Gyroscope access on watch for developers feels a bit like a security leak to me, but I’m sure there will be a great number of new apps that can leverage it for health applications. Keep in mind, accelerometers are accurate enough to pick up voices these days, so this is a feature that can be used to tap in your voice. Pick your apps wisely. It would be really nice if Apple allowed this feature to be turned on and off per app, like it does for camera and Microphones. There is a new remote app that will make using the Apple TV more useful straight from your phone. Single sign on is a great new feature that reduces the number of times users have to authenticate for each new app they want to use. No more authenticating with a browser each time you want to watch a new TV station. This will be a big deal for all sorts of content publishers. Apple announced better searching with Siri to allow the same context aware search that they want to give their users accross platforms. Dark mode is a nice feature that lowers the brightness of the background, however I was expecting them to do something more clever – like making it time dependent, or reducing the blues, like they can with the Nightshift feature on the iPhone. One somewhat odd feature is that it allows the user to add apps on their phone and simultaneously adding it to the TV. I can see this going terribly wrong in all sorts of different ways. What if that app wasn’t exactly one you wanted the family to know about? It also begs to question who owns the authentication at that point, will it only work when that phone is present (what happens when they leave the party?) etc… Etc… This one could end up being troubles for Apple and users alike. The iCloud integration with videos/photos and the like is increasingly being pushed by them. Microsoft is doing something similar with the likes of OneNote/OneDrive – pushing all users into the cloud. This is a nice feature but it’s also rather unnerving to know that that information is so easily accessed without any sort of guarantees on how it is secured. Firstly the company renamed OS X to macOS and the next version will be called Sierra. This is actually a nice switch and one that should have come ages ago. But better late than never. I wonder if this will affect the user agent of the browser though. If your website uses browser User-Agent strings for something this will be an issue to watch out for. The company talked a lot about “Continuity” between the iPhone and Desktop. I like this concept a lot – as it allows the average user to move between devices easier. One such feature is auto-unlock via watch. Just make sure your watch is on you at all times… Like… Don’t ever leave it charging next to your computer? Universal Clipboard is a great feature, but really should be expanded to all sorts of different devices. This one will absolutely screw people who forget what they were clipping and end up getting something on another device, or overwrite their clipboard accidentally. I’d prefer it if such a feature were enabled only on a case by case basis instead of universally. iCloud Drive is really becoming more of a Dropbox clone, where devices have synced applications. Optimized Storage removes old files and syncs old files that you may want again to the cloud. In their demo they freed up almost half of the drive. But this requires that you are okay with syncing all of that data to the cloud. Apple Pay for browsers is a nice feature – and will no doubt be a fun attack surface for experts going forward. Tabs in Apps (as opposed to browsers) is a ho-hum feature that will no doubt make developers lives easier. But it doesn’t have as much impact on users because the number of apps that will use it is no doubt relatively small. Picture in picture allowing in-browser movies to play in separate windows is a really nice feature that is a long time in coming. It allows the user to watch TV while still paying attention to their work since they don’t have to dedicate the entire screen to the movie or their browser. Raise to wake feature is one that makes it so that one less button needs to be pressed to wake up the phone. This will probably have battery implications, and heat issues in your pocket if you happen to be doing a lot of weird exercises with the phone in your pocket. Perhaps they have some way of detecting that it’s in your hand, and I hope so, because this could be a really annoying feature otherwise. I can see plenty of situations where I have the phone in my hand but yet don’t want it awake (yet). Ultimately I’d prefer if this feature was completely optional. Notifications on the lock screen have gone to an entirely new level. For me this feature is 100% unwelcome, and hopefully easy to disable. Keep in mind one of the major lock features on the iPhone allowed complete access to the phone via Siri and contacts. Also there are a lot of sensitive items that live in people’s text messages, calendars, etc. I really hope this feature can be easily disabled. That said, it’s a neat looking feature that has lots of wonderful context aware and rich useful features allowing you to read, dismiss or interact with apps without unlocking your phone. Developer access to Siri seemed like a hit – but it’s a bit of a question how this will actually work. If I want to own the word “food” and so does some other application owner, who wins? Photos can now identify which places you’re in and the phone to identify faces, object and scene recognition. This has plenty of uses, for making searching through photos easier. It’s not clear if this was going to be made available to app developers, but it’s easy to see a world where other types of wearable devices like glasses, or real-world cameras can help disclose who’s at your door without having to remember their name or even see them with your own eyes. Better maps give you better routing details, alternate routes, traffic, etc. One of the more interesting features was it allows apps to hook into maps to do things like book cars, book a restaurant etc. all within the map itself. Apple music looks prettier. It also has easier navigation, lyrics, discovery service (think of this as Spotify’s discovery service competitor) and interestingly a way to connect to artist’s social profiles. Apple News – currently has 2000 publishers and a way to do subscriptions. I like this feature because it gets news publishers out of the business of selling ads and back into doing journalism. “Breaking news” notifications showing up on the lock screen would be nice, but for me this feature would be most useful only if it were breaking news of certain very specific requirements, because notifications are already way too noisy and distracting as is. 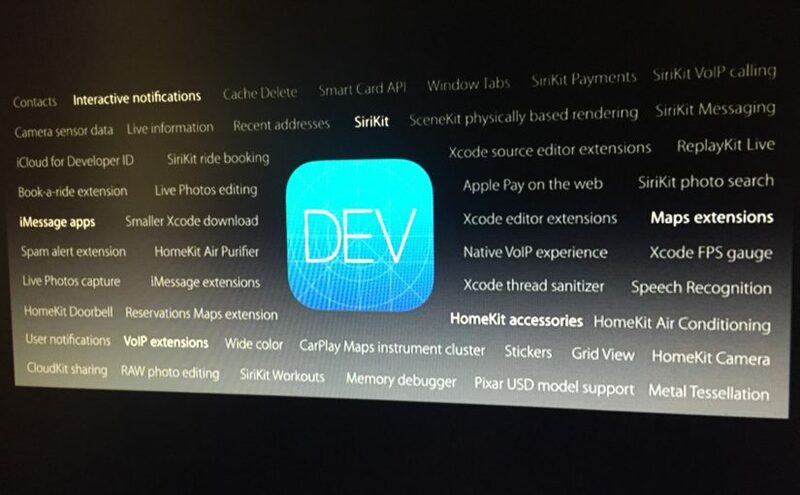 HomeKit introduced a new “Home” iOS app. This feature looks really neat and I can see a lot of potential in its future. It has timed events (wake me up at X time and open the shades” or specific type of events “It’s movie night, turn down the lights and turn on the TV”. It’s a really great looking feature but this is going to require some physical hardware in people’s houses to work. One way around part of that is that remote access is done through AppleTV if you’ve already got one. This enables geofencing as well so certain things can happen at certain times when the Apple TV recognizes that you’re in proximity of your home. Voicemail transcription services on the phone is a really nice feature for when you’re in a meeting, someone’s left you a voicemail but you don’t want to be rude and put the phone to your ear. iOS 10 allows a nicer 3rd party call screen to give companies more flexibility in using the device. This is a bit of a hit to carriers because more data will be traveling over WiFi (in my opinion that’s great). They also glossed over more types of buttons to call people over alternative phone apps like WhatsApp or Facebook etc. This will give you a much faster way to find and call your friends. Cisco Spark app integration will allow you to get your desk phones on your iOS device. Messages had a big overhaul. They have rich links, better access to the camera and photos, 3x bigger Emojis, Emoji prediction, Emojify words that when highlighted can easily be turned into the corresponding Emoji, bubble effects, Tapback, handwriting, digital touch, full screen messages, etc. Most of this seems relatively small and more likely to be an annoyance than useful, compared to the fact that iOS is now opening messages to developers. At first this just seemed to be competing with FaceBook messenger’s ability to send money though the app. But because it’s app driven it allows things like collaboration within apps through messenger for things like taking everyone’s order online straight through the interface. Notes collaboration will be a super useful tool across devices – allowing multiple parties to work on a single document. They glossed over several other features like a “conversation view” in email, editable live photos and a split view Safari (sadly only on iPad). Privacy was a big punctuation mark at the end. With end to end encryption, on device intelligence rather than in the cloud, no user profiling in searches, and something they describe as differential privacy, the iPhone is designed to keep you more private than ever, while still allowing you to collaborate as you want. I was hoping they’d offer additional features here, like ephemeral iMessages, etc but maybe that’s coming later. Swift playgrounds is an app that allows people to learn how to code in Swift to create more applications. It comes replete with lots of example applications, demo code and a new coding keyboard. Sadly this is only for the iPad, and only Swift and doesn’t seem to have a way to immediately turn it into an app and publish it. But maybe all of that is coming. I collectively heard 5 thousand application developers in the audience shrug at this because they probably see it as a new onslaught of competitors entering the market, but this is surely good for Apple. I’d really prefer if Apple didn’t treat iPhone users like second hand citizens, but I understand that there is limited screen real-estate so sometimes this happens. All in all it was interesting. Not much in the way of fixing many of the existing problems with many of the apps, notifications, or usability, but the new features are very nice.